Congratulations to everyone who has survived the Formula One off-season! I know what you’re thinking: “Man, I really wish someone told me all the best things to drink during every race this year.” Well, never fear. I, a master mixologist and motorsport expert, have compiled a list of what to drink during every Grand Prix, and how you can watch them. At risk of sacrificing my liver, I am going to do my best to drink my way through this list and while I cannot recommend you do the same, I can give you this carefully compiled list and let you decide for yourself if you would like to raise your glass in a worldwide toast with me. Drinking at 8 a.m. is, after all, not everyone’s cup of spiked tea. I’ve included both an ambitious cocktail that will require actual forethought and the will to mix your own drink along with a realistic beverage that requires very little extra preparation. Back in the mid-1800s, Blow My Skull Off was supposedly invented in Australia by Lieutenant Governor Thomas Davey, a noted alcoholic. The original involves rum, Cocculus indicus (a poisonous plant), cayenne pepper, opium, and water. I am not going to be peddling that recipe here on Jalopnik. Instead, here’s a recipe for the cocktail from Gourmet Traveller, which instead involves boiling water, sugar, lime juice, porter, rum, and brandy and also seems less likely to actually kill you. Stir sugar and 1 liter boiling water in a large bowl to dissolve. Add lime juice and stir. Add porter, rum and brandy, stir and refrigerate until chilled. Serve with ice in small cups. Bundaberg Ginger Beer has made its way to the United States all the way from Australia. Trying to find it, however, can be difficult—so find yourself a tasty ginger beer at the beer store and call it good. If you want to drink it out of a shoe, I won’t stop you. Alcohol is generally only available in hotels and via private licensing in Bahrain, and drinking in public is illegal. As such, they don’t have quite the wide legacy of cocktail mixing that some of the other countries on this list have. Instead, here’s a recipe for a Rose Cardamom drink from Foodess.com. To make syrup, combine all ingredients in a saucepan over medium heat and cook, stirring occasionally, until sugar dissolves. Remove from heat and let stand to infuse for 1 hour. Strain into an airtight jar and refrigerate for up to three months. To make cocktails, stir 1 oz each of bourbon and syrup together in a glass. Fill with ice and top up with iced tea. Add more syrup and/or bourbon to taste. If you’re really not keen on the whole “mixing a fancy drink” thing, make cardamom coffee—a beverage sipped in Bahrain’s cafés. Add ground cardamom to your coffee grounds, make your coffee as normal, then spike it with some rum. You’ll get the spicy, floral cardamom notes for a funky mid-morning kick. Shake with ice and strain into a cocktail glass. Garnish with 2-3 lychees. This race is sponsored by Heineken, so you could always crack open a cold one. But if you want to get more traditional, Chinese party animals mix Scotch (usually Chivas Regal Scotch, but you can use whatever) and green tea. Sharbat is a drink made of fruit syrup that is usually used as a palate cleanser.While it’s been around the Middle East for ages (even making an appearance in The One Thousand and One Nights), it’s more recently been used as a way for Muslims to break fast during Ramadan. Bring the water and sugar to a boil in a sauce pan. Simmer over medium head, stirring until sugar has dissolved. Remove from heat and allow to cool. In a pitcher, combine the pomegranate juice with the cooled syrup. Stir to mix. Chill in the refrigerator. Add a booze of your choice: champagne for refreshing sparkler, vodka for a kick, rum for a spicy treat. Azerbaijani wine is a pretty formidable industry, enough that it’s often considered one of the oldest wine making regions of the world. Finding Azerbaijani wine at the store, however, is probably going to be a tough task. Do as the locals do, and pick up a cheap pinot noir. Mix all the ingredients in a one liter pitcher, chill, and serve. I discovered kalimoxtos in the grandstands of the Canadian Grand Prix. Grab a box of red wine and a 2-liter bottle of Coca-Cola and mix ‘em 50-50. I know, it sounds terrible, gross, and weird, but I assure you that it’s a shockingly delightful drink. Fill a mixing glass 2/3 full of ice, then add the ingredients. Shake for about 30 seconds and strain into a chilled rocks glass. Monaco is near Nice, which is part of the wine appellation Bellet, which is small enough that it usually gets lumped into the larger Provence wine region. Basically, an appellation is just a fancy name for the kind of wine produced by a certain area (like how Champagne is only Champagne because it’s from the Champagne appellation). You can’t go wrong with Cabernet Sauvignon or Syrah. My fiancé, a card-carrying Canadian, has never heard of this (which may be because it’s usually consumed at the Canadian Armed Forces’ parties). I, however, think it sounds incredible, and I am going to be making this hilariously-named milkshake cocktail at every possible occasion under the guise of it being my Canadian initiation. Invite your lactose-tolerant pals over for a Canadian GP and Letterkenny marathon, because this recipe from allrecipes serves a whopping 36 people. This is arguably Canada’s National Beer. The Beer of the North. The company traces its roots all the way back to 1774, so, honestly, you can’t go wrong. Pour it all in a glass, stir, and enjoy. The color of your French GP alcohol consumption should be pink. Thus, you should go to your local wine store and find a nice rosé from France (if you can get one with Cinsault grapes, you’ll be drinking one of the grapes grown in the region). In complete contrast to the absurdity of a Colt 45 with Red Bull, the lazy person’s option is to pick up some bottles of Stiegl Radler, which is brewed in Austria. It’s a barely alcoholic beer mixed with fruit juice (usually something citrusy, like grapefruit or lemon). It’s the ideal summer drink and is wonderful if you are an absolute light weight trying to keep up with your pickled-liver friends. In a large pitcher, combine the Pimm’s the orange and lemon slices, and the mint. Chill for 10 minutes. Stir in ginger ale. Put two cucumber wedges, standing on end, into each of four 1-pint glasses. Fill halfway with ice. Pour in Pimm’s mixture. Push the mint down into the drinks and divide the orange, lemon, and apple slices among the drinks. British ciders are way different than the ones you get in America. Over in the UK, they’re far more bitter and tart—in a good way. Strongbow is delicious, and one you’re actually likely to be able to get in America. Pour wine into ice cube trays and freeze. Blend ice cubes until you reach your desired consistency. Mix in remaining ingredients. Germany basically defined the beer world. All those hard-to-pronounce names on the beer menus at bars are probably German. Pilsners are probably the most popular, and they have a nice light body and a hoppy bite. Traditional Bocks are thick and malty—heavier than you might want in the summer. My personal favorites are Kölsch style beers—it’s brewed with ale yeast but is aged like a lager (they’re also hard to find outside of Germany if they’re not brewed in the states)—and Berliner Weisses, which use soured grains which make for a tangy drink. Fröccs roughly translates to “spritzer”, so you know this is going to be an amazing summer drink. There are a ton of different types of Fröccs in Hungary, depending on your alcohol tolerance. Kisfröccs, “small fröccs”, is a 1:1 ratio of white wine and carbonated soda. Nagyfröccs, “big fröccs”, is a 2:1 ratio of wine to soda, according to Taste Hungary. Nagy házmester means “head janitor” or “landlord”, and is a whopping 4:1 wine ratio. If you have a beer import store near you, this is a great chance to try some Hungarian beer—but, when in doubt, grab a nice hoppy IPA. It’s going to be a similar style to what you’d find in Hungary. And remember that Hungarians don’t clink their glasses! Coffee houses in Bruges often include a free shot of banana liqueur with with drinks because it apparently brings out the flavor of the coffee. You can try this at home by adding some tasty banana liqueur to your home brewed coffee (if you can get the Beyers Koffie brand, you’re definitely going to be onto something). I’ll admit that I’m not a massive beer fan, but I go crazy for a good Flanders red ale. It’s sour with a strong fruit flavor—usually plum, raisin, or raspberry. It’s a little spicy, a little acidic, but not hoppy in the slightest. It’s the wine of beers. If you can find this at your beer store, try it immediately. Blend the strawberries, sugar, and lemon juice to make the syrup. Add a splash of Prosecco to a champagne flute. Pour the syrup and Prosecco in a shaker, fill with ice, and stir gently. Strain into the glass and top up with more Prosecco. Campari is horrible straight from the bottle. (I hear that there are people out there who like it, but they obviously must be some sort of devil.) It is not a swigging drink. Nevertheless, sipping and cringing as you pass the bottle back and forth between you and a friend is the best way to get through any F1 race. Unlike some of its locally named alcoholic counterparts, the Singapore Sling was actually originally served in Singapore—at the Long Bar in the Raffles Hotel, in fact. Add all the ingredients except the club soda into a shaker with ice and shake. Strain into a highball glass and top with club soda. Friends who have visited Singapore for the F1 race (including a good friend who used to live there) reported that cider is, in fact, very popular in Singapore. This may just be because I hang out with people who drink a lot of cider. Whatever the case, cider is basically apple juice, which makes it an appropriate breakfast drink. Speaking of cocktails named after places that they don’t hail from—let’s celebrate the Russian GP with a White Russian! If the Dude abides, then so do I. The coffee liqueur in this recipe is appropriate for a racing wake up call—and this is just as good when you mix all the ingredients with actual coffee. The ingredients and preparation are no secret. It’s a 2:1:1 ratio of Vodka to Kahlúa to heavy cream, mixed and poured over ice. Yorsch, on the other hand, is an actual Russian drink. It is a foul-sounding mix of beer and vodka (the ratio is up to you) that is traditionally drunk in big groups—you toast, then down the whole glass at once. I can understand why, because this doesn’t sound like a sipping drink. A Yuzu Chuhai is Japan’s answer to a lemon sour, often served in informal pubs. There are a lot of strange-sounding ingredients on this list. Shochu is a Japanese hard liquor made from rice, barley, sweet potatoes, buckwheat, or brown sugar. Combine club soda, shochu, simple syrup, and yuzu in a glass and mix well. Add ice cubes and Korean Citron Tea and mix well. Sake is traditionally served warm, but certain modern sakes have been distilled with chilled drinking in mind, whose flavor profiles can be destroyed by getting it hot. Warm sake is awesome, but it requires a very extensive process to actually get it hot. If you’re that motivated, then knock yourself out. I am not, and will drink my sake at room temperature. I am the very stereotypical white girl who genuinely swoons at the sight of a punch bowl-sized frozen marg. This is not that—but it’s just as delicious. This is a traditional Mexican margarita from liquor.com, the kind that eases you into becoming a tequila fiend. Add all the ingredients into a shaker with ice and shake until chilled. Strain into the prepared rocks glass over fresh ice. Garnish with a lime wheel and kosher salt. There are good ways to make a Michelada that create a final product that is a great balance of cool beer, hot spice, and tart lime. This is not that. Fill half a glass with your cooled Mexican beer of choice, then top it off with tomato juice. Squeeze in some lime juice, shake in some hot sauce, add a dash of Worcestershire. Stir, taste, and add whatever else you think it’s missing. If you’re feeling ambitious, you can rim the glass in salt mixed with chili powder. If you’re not, I don’t blame you. Purée avocado, tequila, triple sec, lime juice, cilantro, cayenne, remaining lime zest, and 2 1/2 cups crushed ice in blender until smooth. Divide among prepared glasses and garnish with a lime wheel. This is not the Happy Meal you would get at McDonald’s. This is the kind of Happy Meal that you can only get in Austin, at a place called Barfly’s. It’s one can of Lone Star and one shot of Jäegermeister. If you can’t find Lone Star where you are, then I’m very sorry, because it’s really the only beer, but any of your favorite light beers will do. Quarter 1 lime lengthwise, then cut each quarter in half crosswise and divide pieces between 2 (6 oz) glasses. Add 1 tablespoon sugar to each glass, then muddle lime pieces by pounding and pressing with a wooden spoon until sugar is dissolved. Fill each glass with ice and add 3 tablespoons cachaça to each, stirring well. Make 6 more cocktails in same manner. Did you buy cachaça to make caipirinhas and just... lose all motivation to muddle limes and mix drinks? Never fear, because cachaça shots are just as good as the cocktail itself. I won’t judge you. 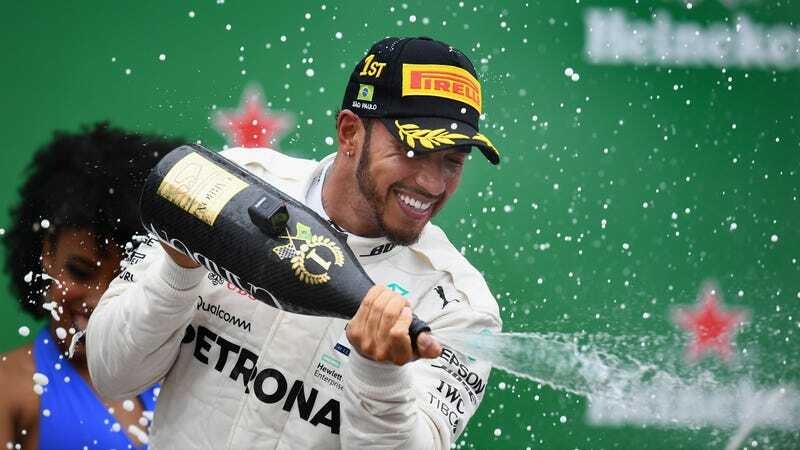 Abu Dhabi is another dry country, but that doesn’t mean you, Race Fan At Home, should not celebrate as if you have just won the world championship in a country that fully allows alcohol. The end of the season calls for champagne cocktails made with the fanciest (to you, good reader) champagne money can buy. This recipe uses Moët & Chandon. You do not have to be so classy. Add all ingredients except champagne to a shaker. Muddle watermelon (if fresh) and mint leaves. Add ice and shake well. Strain into a large wine goblet. Top with champagne and top off with three large ice cubes. The end of the season is a fine time to celebrate by just drinking straight out of the bottle of your favorite champagne. The Abu Dhabi Grand Prix only happens once a year!